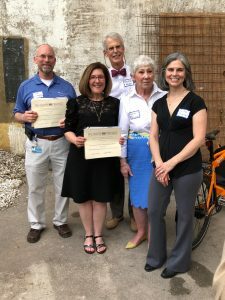 Last night, a team that included several Hopkins employees was recognized by the local historic preservation nonprofit Baltimore Heritage for successfully shepherding Homewood Museum through an extensive drainage improvement project last summer. 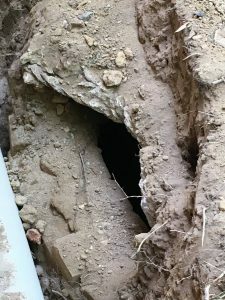 The project—which was undertaken to correct a faulty underground piping system that as causing moisture to pool around the historic house’s foundation—required the installation of new gutters, downspouts, and larger, correctly sloped underground drain lines. It had been in the works for years by 2017, spanning the tenure of Homewood’s previous Director/Curator Catherine Rogers Arthur (1997-2016), interim Director/Curator Heather Stalfort (2016-2017), and then-incoming Director/Curator Julie Rose, who started on June 1, 2017. A project of such scope would be tricky in any circumstances, but Homewood’s use as a museum and designation as a National Historic Landmark, necessitated especially careful excavation work, so as to not compromise the historic structure’s integrity. Homewood Museum is the circa 1801 country home of Charles and Harriet Carroll, members of Maryland’s prominent Carroll family. The house is known for its Palladian-style architecture and world-renowned collections of early American furniture and decorative arts. Through these collections, the house is used to interpret the history of Federal-era America, Maryland, and Baltimore—including the complex personal histories of all the residents of the house, both free and enslaved. Work started on the project in early June 2017 and lasted throughout the summer. The drainage system was designed by local architecture firm SM+P and received the stamp of approval from Maryland Historical Trust, an agency of Maryland Department of Planning. Lewis Contractors, a venerable Owings Mills-based construction management company performed the work, supervised by Cecilia Moreira, the Associate Director of Facilities for The Sheridan Libraries and University Museums. A significant portion of the work involved extensive excavation. Because of the sensitive nature of the site, all excavation within five feet of the building was done by hand. Similarly, the museum’s brick pathway was removed by hand, with each brick cataloged so the pathway could be reinstalled in its original pattern after excavation work was completed. Also on site during the project was a professional archaeologist Robert Wainer of EAC / Archeology, who oversaw a team of three Johns Hopkins University student archaeological interns. Moreira says she was “very proud” to facilitate that student experience, which resulted in the recovery of several historic objects that spoke to food and beverage consumption at Homewood in the early 19th century. The items—which include oyster shells, butchered animal bones, a broken champagne bottle, and white and blue Canton porcelain—are consistent with objects recovered during prior excavations. And visitors to the museum can see the food scraps displayed in Homewood’s Dining Room and the champagne bottle and porcelain displayed in a case in the basement. Rose also was excited that the crew uncovered the home’s original well for the first time since 1983. 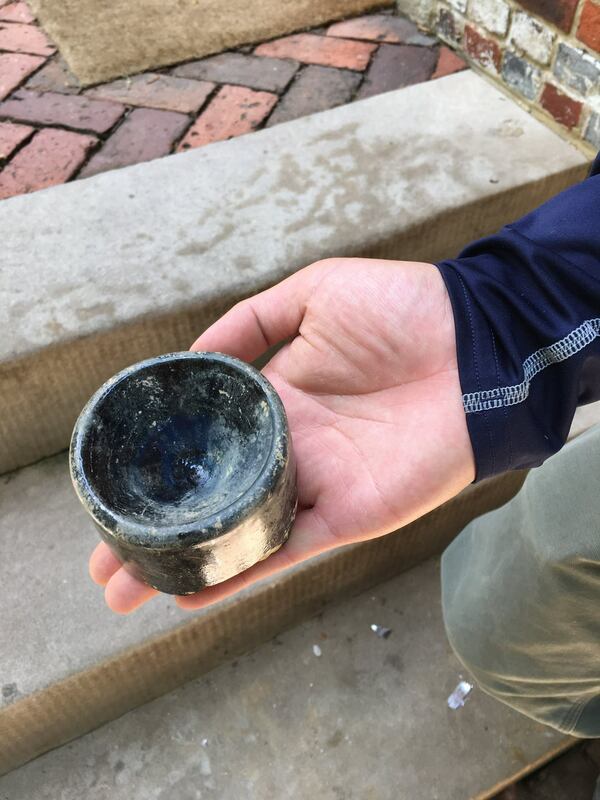 “That was thrilling to see,” says Rose, noting that she and others tossed a 2018 penny into the well before it was closed back up. The awards ceremony was held at the Fox Building in Hampden, where Noxema was once manufactured and where work is underway to convert the building into apartments. In attendance last night representing Homewood were Rose; Moreira; Travers Nelson, Program Manager for Design and Construction at Johns Hopkins University; and Martha Elliott of Lewis Contractors. Also in attendance representing JHU was Chuck Hilseberg a Senior Project Manager for the University’s Facilities & Real Estate, Design & Construction division. Hilseberg collected an award from Baltimore Heritage for overseeing a project to waterproof Krieger Hall between summer of 2016 and summer of 2017. What’s new in Museum Studies? For one thing: the Research Guide!